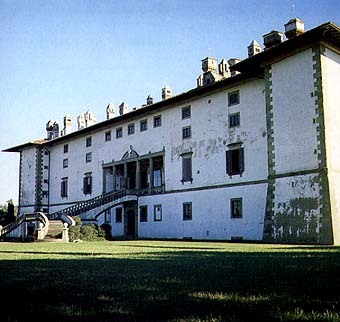 Commonly called "La Ferdinanda", the villa was designed by Buontalenti in 1594 as a "hunting lodge" for Ferdinand I, since it lay in the vicinity of the vast private hunting reserve (hundreds of hectares on Monte Albano), set aside by Cosimo I. The most striking element is the host of chimneys (which has earned it the name of "Villa of the hundred chimneys") which, like so many miniature towers, add a note of gaiety to the austere facade. Actually there are only fourty , and each one corresponds to a specific room. The famous series of lunettes by the Flemish painter Giusto Utens which depict the Medici villas were in the principal room which is at present primarily used for lectures, conventions and banquets. 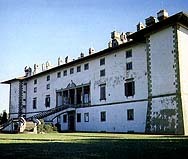 The paintings are now on view in the Museum of "Firenze com 'era" The panorama seen from here is truly splendid.